Includes the option to hike the breathtaking 4 Mile Trail. Includes lunch, bottled water, snacks, entrance fees, and gratuities. $775/party of up to 4 persons. $250 deposit. Balance collected within 30 days of tour. 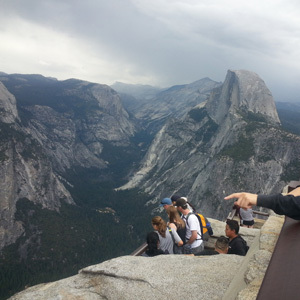 Your private tour of Yosemite National Park, one of UNESCO’s World Heritage Sites begins with the spectacular Glacier Point overlook, where you will have breathtaking views of the Sierra Nevada Mountain Range and Yosemite Valley below. 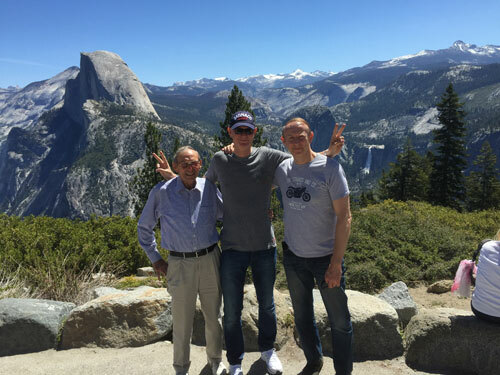 We take you on to Tunnel View and then on to Yosemite Valley for a once in a lifetime adventure seeing beautiful granite cliffs and magnificent waterfalls. You may have an optional lunch at the famous Ahwahnee Hotel. In the morning, we drive through Oakhurst where we pass by the historical Talking Bear and several businesses in town who feature Bears in front of their businesses. As we approach the Yosemite’s South Entrance Station we climb to a higher elevation and you will notice changes in the trees, and the exhilarating pine-scented breezes. 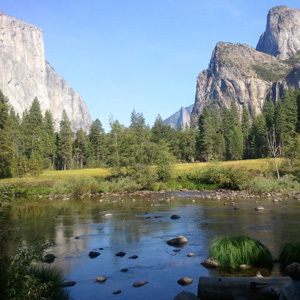 (If we pick you up in the Mariposa/Merced areas or if we encounter snowy weather conditions, we may travel through Mariposa, driving next to the beautiful Merced River, and into the West entrance.) From the South Entrance, we stop at Chinquapin, and then on to Glacier Point (where most tour companies do not and cannot visit due to commercial vehicle size restrictions). Glacier Point is an overlook with a commanding view of Yosemite Valley, Half Dome, Yosemite Falls, and the Yosemite High Country. This viewpoint is accessible by smaller vehicles from approximately late May through October of November. 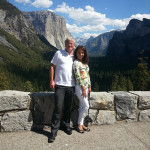 The short walk to Glacier Point will reward you with a breathtaking view of both Yosemite Valley and the mountain tops. At Glacier Point, guests who are looking for hiking time have the option to hike down the Four Mile Trail, which will end on Southside Drive, where they can cross Swinging Bridge and follow the trail to meet us at Yosemite Valley Lodge. The Four Mile Trail is about 5 miles from Glacier Point to Yosemite Valley Lodge. Most of the time we offer the option of hiking down from Glacier Point to the Valley but sometimes due to scheduling we may offer the option to hike up to Glacier Point from the Valley. The elevation at Glacier Point is 7200 ft and the Yosemite Valley is at 4000 ft elevation. In 2016 President Obama and his family hiked this spectacular trail and only Crossroads Tours offers this option to you. Crossroads Tours is not offering a personal guided hike and by accepting to hike on the Four Mile Trail or any other trails you are releasing Crossroads Tours from any liability. This hike is STRENUOUS and going downhill is very steep at some places and you must be prepared with appropriate clothing, shoes, walking stick, water and whatever else you may require. It takes about 2-3 hours hiking downhill. Crossroads Tours will allow you 4 hours maximum to reach the Yosemite Valley Lodge. Beyond 4 hours Crossroads may not be able to standby for you and you may have to find other transportation back. If Crossroads has to wait for you the cost will be $ 95 an hour which will be calculated after 4 hours. We continue to drive back to Chinquapin and down to Yosemite Valley where we travel through Wawona Tunnel, to Tunnel View, where we can see Bridalveil Falls, El Capitan, and Half Dome. In Yosemite Valley, we visit Bridalveil Falls, El Capitan, Yosemite Chapel, Sentinel Bridge, Half Dome, and Yosemite Falls. We walk to the base of Yosemite Falls. Guests can find all types of food and beverages at the Yosemite Lodge Food Court. In addition, there are gift shops located here for purchasing souvenirs. Upon resuming, we visit the meadows in front of El Capitan to see if anyone is rock climbing. From there we drive along side of the Merced River and look at the place where President Theodore Roosevelt and John Muir camped in May, 1903. 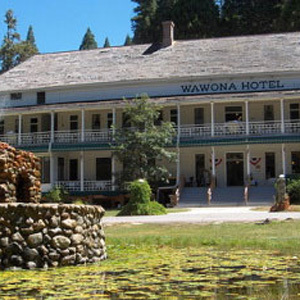 Time permitting, on our way back we will stop at the Pioneer Village History Center and also the historical landmark Wawona Hotel where you can view young Sequoia trees of the Park. The Pioneer Yosemite History Center consists of historic structures from different eras of Yosemite history. Originally constructed in different locations throughout Yosemite, they were moved to Wawona in the 1950s and 1960s. Each building represents a different chapter in the Yosemite story. Allow Yosemite history to come to life as you travel back in time to an era of horse-drawn wagons, covered bridges, and log cabins. The total time of the tour is approximately 8 hours. In this tour people will see more of Yosemite National Park in one day than most other tours of Yosemite. Since this is a private tour, we are able to accommodate your special requests to visit other areas of Yosemite National Park.